Peeps, are you guilty of spending hours browsing the internet for hoarding travel essentials, drinkware, and more? We are, but we discovered this online store — Thathing — and now we know where to get our dose of quirky things without dwindling away our time. We have also curated a list of epic things for you to shop away for, from this store. Although there are plenty of reversible trays, we are crushing on this Snow White-themed tray that also doubles up a trinket holder. Plus, it’s foldable, so you can just get it out of your shelf only when you want to ace that Instagram shot with coffee and cookies on the tray. Ladies, you simply cannot say no to this one. With a big cupcake in the foreground and pink polka dots in the background, we think this one can brighten up your work days. Pack your laptop in this 15″ inch sleeve, and grab eyeballs everywhere you take. What’s the first thing you utter when Mum wakes you up in the morning? “Just 5 more minutes, please”, are we right? Or are we right? We found this cute little eye mask that says the same and we couldn’t stop ourselves from getting it. No need to say anything now, just point to it when your human alarm comes to wake you! Got a plain wall that needs a splash of colour? Then the canvas frames can serve the deed. Whether you are looking for one to deck up your bedroom or workspace, this one is sure to lift your mood. Travel much? 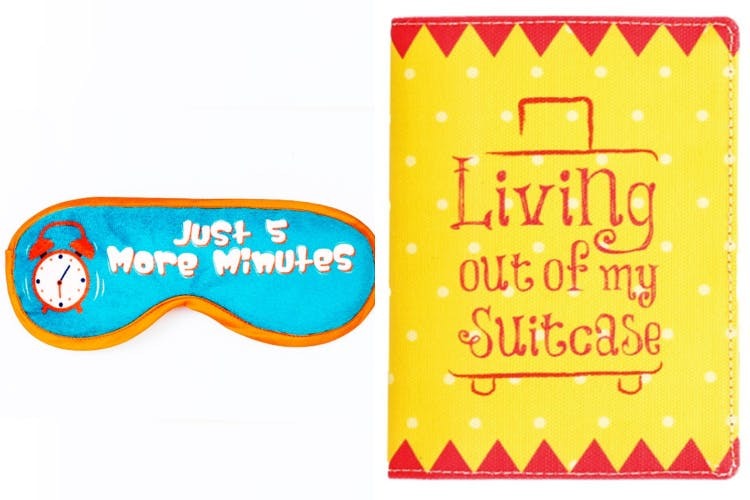 You’ve got to grab this passport wallet that says ‘living out of my suitcase’. Along with a section for a passport, it has more sections for you to stash your cards, some cash, and even coins. This is for you, wanderlust junkies! Does your tablet or e-reader keep slipping out of your hands? We know you need a sleeve that holds it together. Our vote goes to What Happens Online Tablet Sleeve that is themed after What Happens In Vegas. Lined with suede on the inside to protect the screen from any scratches, it also has a pocket on the front where you can pack you cables and earphones. The strap helps the tablet stay tucked in too. Our vanity affair has risen to newer heights after spotting this makeup pouch. Whether you’re a lipstick lover or a nail paint fiend, you can pack all your beauty secret products in this one. For the ones who take off regularly, this one’s spacious enough to carry travel packs too. Want to gift someone a bookmark or are you an avid reader yourself? Look no further than the collection of canvas bookmarks here. Our personal vote goes for the Blue Elephant Canvas Bookmark because it reminds us of the DIY bookmarks we’ve created as children. Also, these are made from canvas, so unlike the paper bookmarks, these are durable.